Can Ascension Parish Council through a Charter Amendment make the Planning Commission advisory only for consideration of Major and Minor Subdivision approvales? Would a vote to override the decision of the Planning Commission require a two-third’s (sic) vote as provided by La. R. S. 33:109? Neither question is all that complicated. Our review of opinions released by the Attorney General did not reveal one in response to the subject request referenced above. Having obtained a copy of that request penned by 23rd JDC Assistant District Attorney O’Neal Parenton we are compelled to point out a glaring deficiency in the request. 1) Can Ascension Parish through a Charter Amendment make the Planning Commission advisory only for consideration of Major and Minor Subdivision approvals? The Parenton-penned request did include citation of five other Revised Statutes, we believe, in the attempt to delude your office into an inaccurate opinion. We would hope that La. R.S. 33:103(F) is considered as the Attorney General prepares the responsive opinion as we deem its provisions crystal clear and controlling the issue at hand. When can we expect the responsive opinion to be issued? 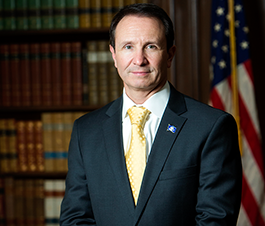 About what we’ve come to expect from AG Jeff Landry’s office.